This eighty-six minute video of true stories about the modern-day realizer Avatar Adi Da Samraj was recorded during a live webinar broadcast on the second story telling and book signing world tour. 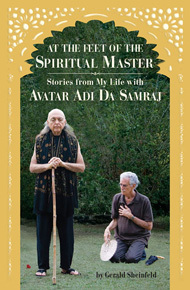 The stories from forty-five years with Avatar Adi Da are from the book "At the Feet of the Spiritual Master. Stories from my life with Avatar Adi Da Samraj". Who is Avatar Adi Da Samraj? What is his transforming work with all who respond to him? What's the truth about real God? Are we separate, or are we part of a perfect Unity? What is the cause of all suffering? And how to transcend that cause? Why does the spontaneous feeling of attraction to Avatar Adi Da change the understanding and feeling about life and death? I'm sure these stories will also answer all your other important questions, or if not they will direct you where to get those answers. This video has thirteen main stories. And several shorter ones. Once purchased you can forward directly to any of the main stories. To stay with Franklin or go? He revealed He is entirely the giver of Divine Enlightenment. He awakened my heart to feel and “know” He is the true free condition of all.